MPs will be able to stop the Irish border backstop being used for more than a year, Downing Street said tonight. 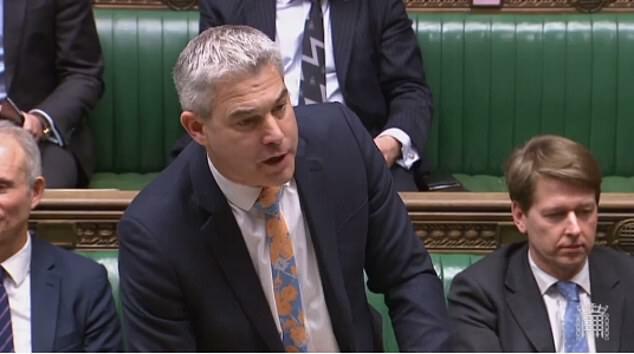 The claim came as Brexit Secretary Stephen Barclay said the Government would accept an amendment on the role of Parliament on triggering the backstop. Theresa May unveiled the changes to her Brexit deal as she continued her last-ditch charm offensive to try to win the backing of rebel MPs. 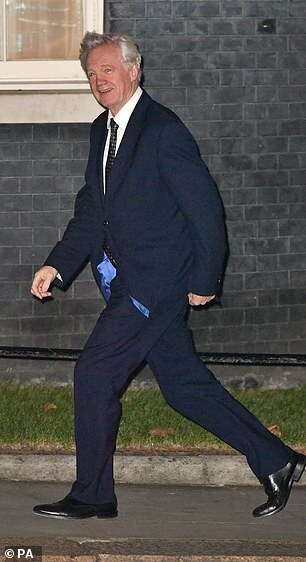 The PM threw another drinks party for Tory MPs and their spouses in Downing Street, where ministers are schmoozing the backbenchers in a bid to whittle down the number expected to revolt in next Tuesday’s crunch vote on the deal. 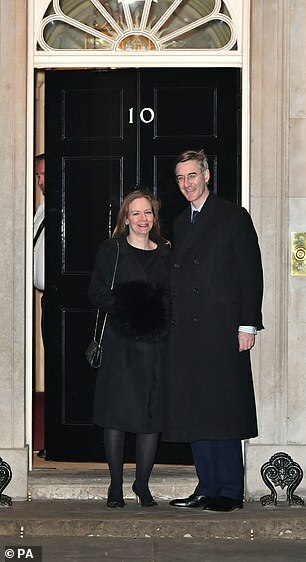 Tory Brexiteer and rebel in chief Jacob Rees-Mogg arrived at the bash at No10 tonight with his wife Helena tonight. The change announced today sets out that Parliament will vote on whether to go ahead with the backstop in March 2020, or to take the option of extending transition beyond 2020. It sets a ‘duty’ on the Government to either have a final UK-EU trade deal or a new way of keeping open the Irish border outside the backstop within one year. Downing Street insisted this means MPs could vote in confidence the backstop would last for a maximum of one year at the end of transition. Mrs May’s spokesman said: ‘What the amendment means is if Parliament were to choose not to commence the powers needed to implement the backstop, the Government would have to find another way to implement the commitments in the withdrawal agreement. The divorce deal says the border could be kept open by a full-blown UK-EU trade deal, ‘alternative’ arrangements that have not yet been established, or the backstop. 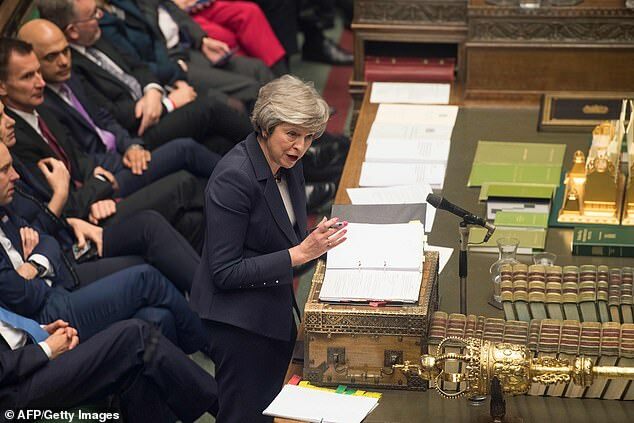 Mr Barclay made his intervention as he opened the first of five days of debate on the deal before the crunch vote on Mrs May’s deal on Tuesday. MPs are concerned that the arrangement may not be time-limited and want legal guarantees over this matter. Mrs May previously postponed a vote on her Brexit deal before Christmas as she faced defeat and pledged to secure assurances on Northern Ireland. 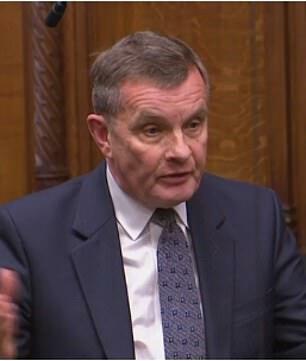 Opening the debate, Mr Barclay described Mrs May’s plan as the ‘best deal to honour the referendum result’ and said it ‘preserves that hard won peace’ in Northern Ireland. 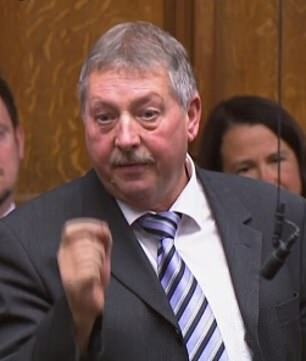 But the DUP’s Brexit spokesman Sammy Wilson said the agreement in fact placed the Belfast Agreement ‘in jeopardy’. 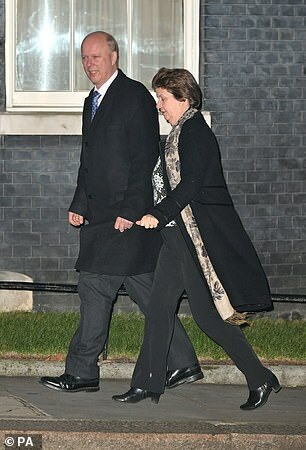 Tory former minister Jo Johnson later intervened to accuse the Government of peddling ‘fantasy’. Shadow Brexit secretary Sir Keir Starmer told the Commons ‘nothing had changed’ with Mrs May’s deal despite a month’s delay. He said: ‘They were of course challenged on the basis this was just a way of delaying, avoiding a humiliating defeat, they were just running down the clock. ‘Now, 30 days on, those rebuttals rung hollow.